All new menu, full breakfasts and shelves full of the perfect healthy snacks for later! 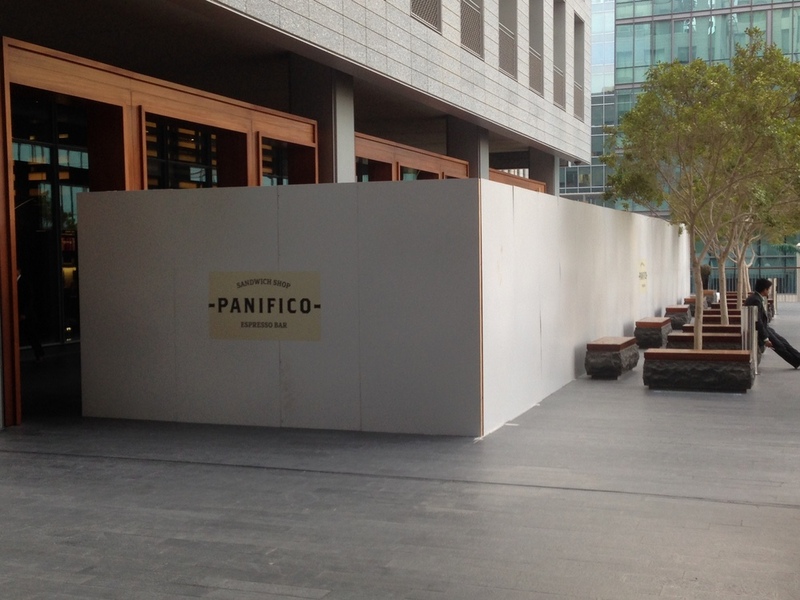 That's right folks, we're now delivering Panifico all over DIFC just in time for summer. Call us anytime and one of our handsome fellows will rocket over to you at lightning speed to bring you that tummy satisfying bag of delishiousness..
Panifico - We're Open for Business! It's been a long time coming and we've had a genuinely great time making our dreams a reality. If you've been following our progress then you know how much passion went into bringing DIFC the best paninis, salads, smoothies and espresso that Dubai has to offer. We're proud to finally announce the opening of Panifico in DIFC, and we invite you all to come by and say HI! Panifico is the manifestation of years of dreaming and preparing. Have a look at our dream come true! Outdoor courtyard and cafe area. It's just how we imagined! Order here! Note the display case intended to make your mouth water. A fantastic selection of grab-and-go beverages, sandwiches and salads. If you're always in a hurry and in the mood for gourmet, you're going to become best friends with this cooler. We brew some of the best coffee in Dubai. Tried, tested and raved about! Our indoor seating area. Designed to protect you from the elements yet make you feel like you're still in the great outdoors. Spreading the love around Dubai. The Panifico Food Truck is fully operational and people love it! We would like to thank every person that was involved in bringing Panifico to life. It's been an amazing journey. Stop by our location in DIFC and enjoy the fruits of our efforts. Hope to see you soon for some seriously delicious food and a fantastic cup of coffee! We wanted to share some of our designs for you to see the thought and dedication the entire team has put into making Panifico a reality. Sneak peek.. Wait until you can taste the real thing. We open very soon!